March 16, 2017 -- Artificial intelligence (AI) developer MedyMatch Technology scored a major coup with the announcement of a strategic relationship on Thursday with IBM Watson Health. 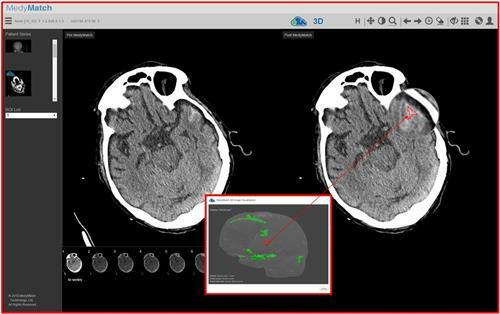 Under the deal, Watson users will have access to MedyMatch's decision-support application for analyzing noncontrast head CT studies. MedyMatch's application will be distributed by IBM Watson Health's Imaging group through its vendor-neutral sales channels. In the future, the companies will work together to develop interoperability between each of their offerings. The agreement is a huge boost for MedyMatch, which was founded in Israel in 2013 to commercialize work on artificial intelligence technology first performed at Hadassah Medical Center in Jerusalem. MedyMatch's goal is to develop tools that leverage AI technology to provide decision support for physicians at the point of care, according to Gene Saragnese, chairman and CEO of MedyMatch. MedyMatch's first algorithm targets a difficult problem encountered when treating patients who present to the emergency room (ER) with suspected stroke or head trauma: determining if they have a bleed in the brain. For stroke patients, it's critical to quickly administer clot-busting drugs such as tissue plasminogen activator (tPA), but the treatment would be devastating to a patient with a brain bleed. As a result, some patients who desperately need tPA sometimes go untreated, which can lead to permanent disability and years of higher healthcare costs, as well as malpractice issues, Saragnese said. The MedyMatch application analyzes noncontrast head CT scans for signs of brain bleeds. Image courtesy of MedyMatch Technology. MedyMatch has attempted to solve the problem through an algorithm that analyzes the noncontrast head CT scans typically administered to patients appearing at the ER with suspected stroke. The average radiologist only detects about 80% to 85% of brain bleeds, whereas the algorithm has demonstrated a sensitivity of 97% and a specificity of 90% in early trials. "Indecision leads to lack of treatment, and lack of treatment leads to long-term debilitation of patients," Saragnese told AuntMinnie.com. "When someone rolls in at 3 a.m., you need to make crisp decisions, and we want to be there helping them make decisions." How will MedyMatch work with IBM Watson? The algorithm will be incorporated into the Watson environment at IBM installations, using a workflow designed to require minimal intervention by physicians. DICOM images from all noncontrast head CT exams will be automatically routed to MedyMatch, which will analyze the data and return to users an annotated image series highlighting suspicious areas that can be viewed alongside the original scans, using whatever PACS or viewer the physician is reading from. For IBM Watson, the deal will further expand the company's portfolio of imaging-related tools that it can offer to potential customers, in this case addressing a condition (stroke) that is projected to affect 3.4 million victims annually by 2030, costing $240 billion a year. The agreement complements a relationship signed in October 2016 with Siemens Healthineers that makes Watson available to the imaging OEM's installed base. The stroke algorithm is the first product in MedyMatch's pipeline, and the company plans to conduct a clinical trial in support of a class III premarket approval (PMA) application to the U.S. Food and Drug Administration that is expected to be filed in the second quarter of 2017. MedyMatch and IBM Watson will work on integration of their respective technologies in parallel with MedyMatch's regulatory efforts, so that once approval is in hand it hopefully will be ready to start recognizing revenues, Saragnese said. While stroke is the first application for MedyMatch, the firm believes its technology can be adapted to analyze data from other imaging modalities and other clinical conditions, while maintaining a focus on acute care, according to Saragnese. "At the root of what we are trying to do is bring higher-quality decision-making to healthcare and help all physicians make better decisions," he said. "We see a tremendous opportunity in acute care. We have been chosen and have developed an agreement with a world-class company that is aligned with what we are trying to accomplish."